Socialism and the process of socializing the economy does not only impoverish society in basic economic terms. It also corrupts the very “soul” of a society by destroying the natural order that encourages serving our fellow man. … a policy of the socialization … affects the character structure of society, the importance of which can hardly be exaggerated. As has been pointed out repeatedly, adopting … socialism instead of capitalism based on the natural theory of property implies giving a relative advantage to nonusers, nonproducers, and noncontractors as regards property titles of the means of production and the income that can be derived from using of these means. If people have an interest in stabilizing and, if possible, increasing their income and they can shift relatively easily from the role of a user-producer or contractor into that of a nonuser, nonproducer, or noncontractor—assumptions, to be sure, whose validity can hardly be disputed—then, responding to the shift in the incentive structure affected by socialization, people will increasingly engage in nonproductive and noncontractual activities and, as time goes on, their personalities will be changed. A former ability to perceive and to anticipate situations of scarcity, to take up productive opportunities, to be aware of technological possibilities, to anticipate changes in demand, to develop marketing strategies and to detect chances for mutually advantageous exchanges, in short: the ability to initiate, to work and to respond to other people’s needs, will be diminished­, if not completely extinguished. People will have become different persons, with different skills, who, should the policy suddenly be changed and capitalism reintroduced, could not go back to their former selves immediately and rekindle their old productive spirit, even if they wanted to. They will simply have forgotten how to do it and will have to relearn, slowly, with high psychic costs involved, just as it involved high costs for them to suppress their productive skills in the first place. But this is only half the picture of the social consequences of socialization. It can be completed by recalling the above findings regarding capitalism’s and socialism’s apparent differences. This will bring out the other side of the personality change caused by socializing, complementing the just mentioned loss in productive capacity. The fact must be recalled that socialism, too, must solve the problem of who is to control and coordinate various means of production. Contrary to capitalism’s solution to this problem, though, in socialism the assignment of different positions in the production structure to different people is a political matter, i.e., a matter accomplished irrespective of considerations of previous user-ownership and the existence of contractual, mutually agreeable exchange, but rather by superimposing one person’s will upon that of another (disagreeing) one. Evidently, a person’s position in the production structure has an immediate effect on his income, be it in terms of exchangeable goods, psychic income, status, and the like. Accordingly, as people want to improve their income and want to move into more highly evaluated positions in the hierarchy of caretakers, they increasingly have to use their political talents. It becomes irrelevant, or is at least of reduced importance, to be a more efficient producer or contractor in order to rise in the hierarchy of income recipients. Instead, it is increasingly important to have the peculiar skills of a politician, i.e., a person who through persuasion, demagoguery and intrigue, through promises, bribes, and threats, manages to assemble public support for his own position. Depending on the intensity of the desire for higher incomes, people will have to spend less time developing their productive skills and more time cultivating political talents. And since different people have differing degrees of productive and political talents, different people will rise to the top now, so that one finds increasing numbers of politicians everywhere in the hierarchical order of caretakers. All the way to the very top there will be people incompetent to do the job they are supposed to do. It is no hindrance in a caretaker’s career for him to be dumb, indolent, inefficient, and uncaring, as long as he commands superior political skills, and accordingly people like this will be taking care of the means of production everywhere. A Theory of Socialism and Capitalism, page 45-47. Ludwig von Mises had the social justice warriors nailed 50+ years before they became a thing. This search for a scapegoat is an attitude of people living under the social order which treats everybody according to his contribution to the well-being of his fellow men and where thus everybody is the founder of his own fortune. In such a society each member whose ambitions have not been fully satisfied resents the fortune of all those who succeeded better. The fool releases these feelings in slander and defamation. The more sophisticated do not indulge in personal calumny. They sublimate their hatred into a philosophy, the philosophy of anti-capitalism, in order to render inaudible the inner voice that tells them that their failure is entirely their own fault. Their fanaticism in defending their critique of capitalism is precisely due to the fact that they are fighting their own awareness of its falsity. “The suffering from frustrated ambition is peculiar to people living in a society of equality under the law. It is not caused by equality under the law, but by the fact that in a society of equality under the law the inequality of men with regard to intellectual abilities, will power and application becomes visible. The gulf between what a man is and achieves and what he thinks of his own abilities and achievements is pitilessly revealed. Daydreams of a ‘fair’ world which would treat him according to his “real worth” are the refuge of all those plagued by a lack of self-knowledge. Sweden is regarded by many as the ideal balance between capitalism and socialism. A lot of people genuinely believe it is a “Workers’ Paradise.” They worship the “Nordic model” as something all Western democracies should emulate. Recent events show that the model of a lavish welfare statism cannot erase deeper economic and cultural divisions. Right now, Sweden is seeing the worst riots in years as immigrant youths trash everything in sight, and clash with mobs of immigrant-haters. Cars are torched. Rocks are thrown at police and firefighters. Schools have been set ablaze. 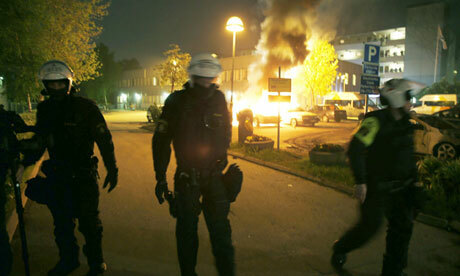 Sweden has experienced various riots in the last few years. Usually these cool off after a day. The latest riots have gone on for a week. The situation evokes memories of the 2005 Paris riots, or the 2011 London riots. But why should anyone want to riot in Sweden? Isn’t everything perfect? The disturbances erupted in Husby last weekend, after police shot dead an elderly man brandishing a machete inside his house. Angered at what they saw as police heavyhandedness, youths torched cars and buildings and stoned police and firefighters. Police were then forced to draft in extra manpower from outside Stockholm as the trouble spread to other immigrant-dominated suburbs of the capital and towns such as Orebro in central Sweden, where 25 masked youths set fire to a school on Friday night. “In the beginning it was just a bit of fun,” said one young man in his early 20s who did not wish to be named. He was one of a Husby group of 30-40 youths that battled with police. The Swedes just can’t understand why this is happening. It’s fair to wonder, if this can happen in Sweden, why not everywhere? Multiculturalism has never worked anywhere, ever, in all of human history. It’s not because different groups of people can’t get along. Trade and peace is natural, even between people of different religion, race, culture, or ethnicity. The blame instead rests on the institution of the state itself. Rather than erase conflict between different groups, as many like to believe, welfare statism aggravates the conflict between them. This happens because the state encourages not cooperation and respect between people, but rather dependence on its ability to transfer property from one group to another. This always breeds resentment between people who are more or less on the dole than other people. The state cannot create harmony between people. It creates only discord.